Content by Tony Macklin. Originally published on November 20, 2017 @ tonymacklin.net. Darkest Hour has a grand tour de force performance by Gary Oldman as Winston Churchill. But it's often thwarted by ostentatious direction and a tepid screenplay. Oldman is the highlight of the over-sentimentalized movie. I didn't know how much music there was in the 2nd World War. Horns, strings, and piano keys are everywhere in Darkest Hour. And when Winston impulsively jumps out of a car and visits the London Underground where he chats with the common people, he becomes Mary Poppins. Director Joe Wright seems to see Winston Churchill as a lumbering nanny. The misbegotten scene in the Underground doesn't humanize the movie; it sentimentalizes it. It also awkwardly injects inclusivity in it. Inclusivity is important, but it doesn't have to be shoved in where it seems forced. That cheapens it. 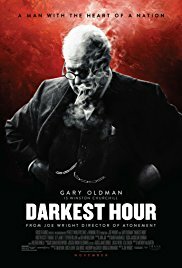 Darkest Hour is set in May 1940, when Churchill became Prime Minister of England. He was chosen reluctantly by many members of Parliament. As Prime Minister, Churchill faced the opposition of many who wanted England to attempt to arrive at a peace treaty with Nazi Germany, which seemed on the way to potentially annihilating England. Churchill fiercely stood his ground against them, and chose to try to evacuate the army trapped at Dunkirk, although that would sacrifice many troops who were on a delaying mission. The cast often transcends the hokum of the screenplay. Oldman give power and vulnerability to his iconic character. Kristin Scott Thomas brings a welcome naturalness to Clementine Churchill, as does Lily James as Winston's typist. Stephen Dillane - one of my favorite actors - is mostly limited to a glum expression as Churchill's adversary Lord Halifax. And, like the occupants of the London Underground, Ben Mendelsohn has to survive a contrived scene when King George VI visits Churchill - as a sudden believer. Up until then the king had been a Halifax backer. Director Wright is more interested in close-ups than character development. He focuses on a cork popping from a bottle, letters typed on a page, eggs frying in a pan, female eyes with a tear on her cheek. Wright loves objects - a piano, a phone, a cigar. Clementine says to Winston, "Are we terribly old?" He responds, "Yes, you are." But generally, contrivance overwhelms any wit. In actual life, Winston Churchill's style served content. In Darkest Hour, style blunts content.